The rapid expansion in the seventeenth century of the colonial settlers into the heartland of America provides a unique insight into human behavior on a grand scale. The mass movement of human beings – which occur at a number of occasions in world history – is an interesting phenomenon, which can be associated with a way of thinking. Most of the colonialists had left their homelands pursuant to intolerance (towards particular political or religious opinions) or poor living conditions. The former can be translated in terms of an oppressive oppositional way of thinking and the latter had to do with a spirit of survival, which could be described in a Shakespearian way as ‘to be or not to be’ – the ultimate two-division. The European colonization of America was – in a quadralectic perspective – permeated with dualistic thinking. Better ways of transportation made it possible to escape the personal situation of discrimination and/or misery. However, many settlers were still born and bred in the same oppositional spirit, which they wanted to evade. So they fell back on their instinctive dualistic apparatus in their newfound freedom – and became successful in a materialistic existence in due course. Initially, the settlers used their freedom to choose a particular layout of their habitations. 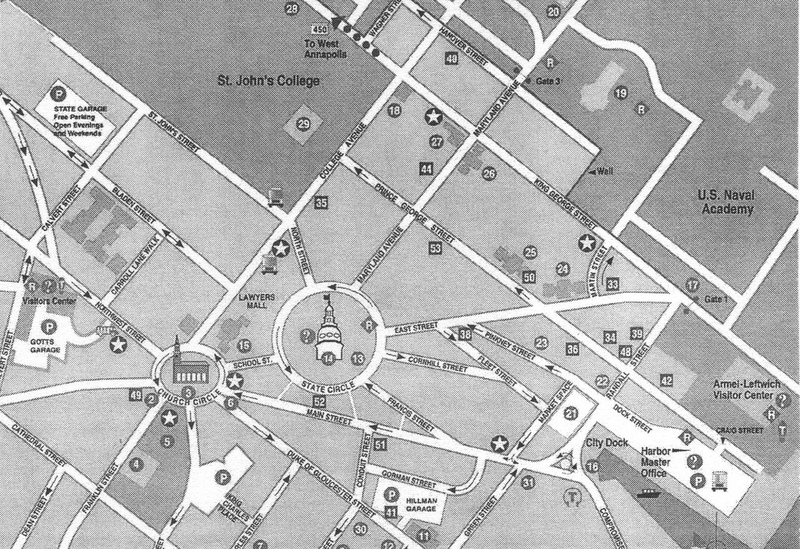 The city of Annapolis (Providence), for instance, favored a plan with circles and radiating streets. Puritans from Virginia founded the capital of Maryland in 1649 and the city got its charter in 1708 from Queen Anne. The St. Anne Church (with the Church Circle) and the State House (with the State Circle) are still the remainders of those bygone days of city planning, followed by new developments in a rectangular order (fig. 608). Fig. 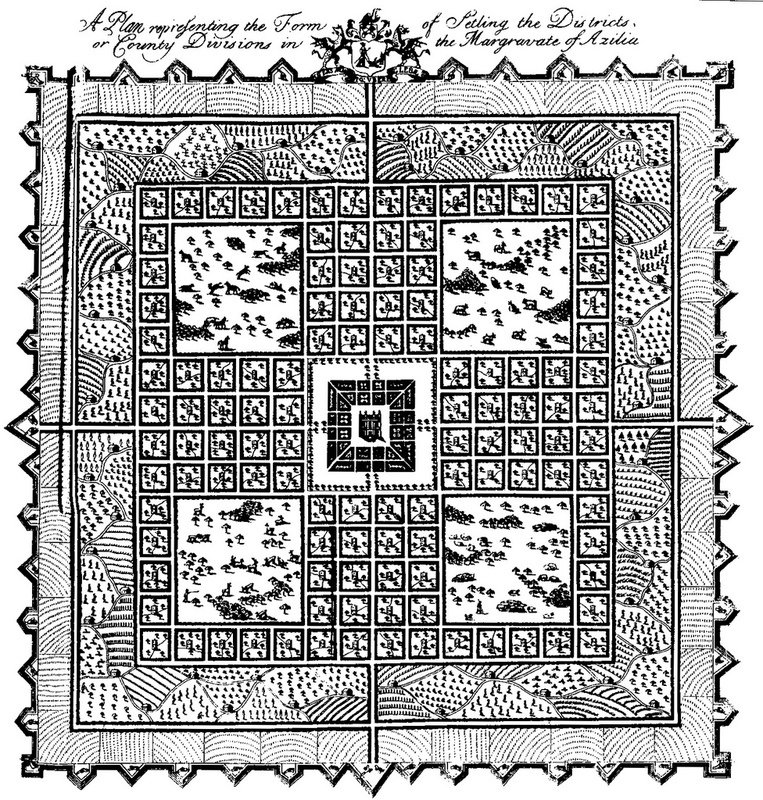 608 – The grid city was just a choice of designs available to the early settlers in America. Other options were sometimes chosen, like the city center of Annapolis (Maryland), which shows the circles as Sir Francis Nicholson drew them at the beginning of the eighteenth century. The spirit of freedom in a terra incognita had to come up with solutions for habitation, and it is remarkable that – apart from ‘naturally’ grown cities – the grid design turned out to be popular in the new colonies. The grid was earlier identified as a Fourth Quadrant member in an ‘evolutionary’ family of basic graphical elements of city plans. The grid (city) does not have – at least in theory – a clear boundary, edge, or entry, since the grid is expandable in all directions. The argument was often brought forward that the rectilinear grid greatly simplified the task of surveying and fitted into the mental pattern of surveyors and civil engineers. Spiro KOSTOF (1991, p. 100) questioned the statement that the urban grid represented an egalitarian system of land distribution. He admitted that the ordinary citizen gained easy access to land in a preliminary phase, and that a grid speeds up the process of absentee purchases. Straight lines meant that it could be easily broken up in lots. However, once the lots had been sold the social mechanisms of individual wealth destroyed any type of egalitarism and ‘what matters in the long run is not the mystique of grid geometry, but the luck of first ownership’. 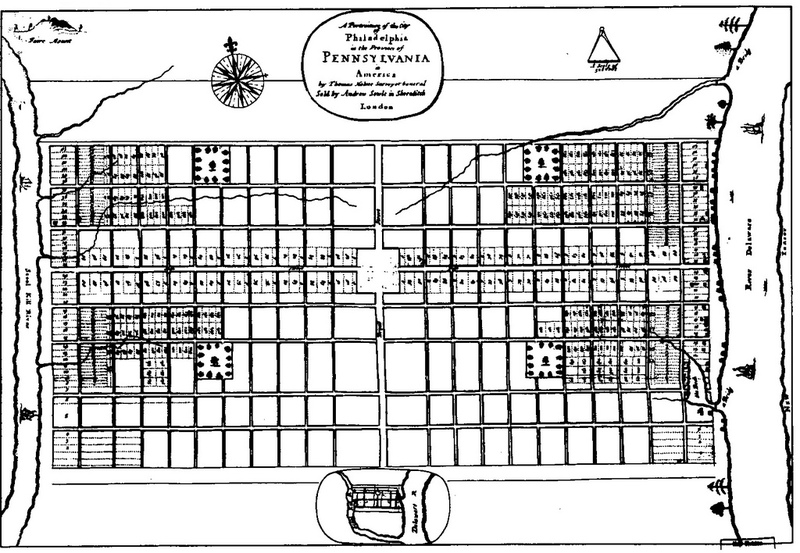 William Penn initiated one of the first grid cities when he created the plans for the city of Philadelphia (1682) (fig. 609). He wanted to make Philadelphia, the City of Brotherly Love, into a rural town rather than a city. He chooses the grid plan, as a tribute of freedom in multiplicity, but many inhabitants stayed near the Delaware River and resold their lots. Fig. 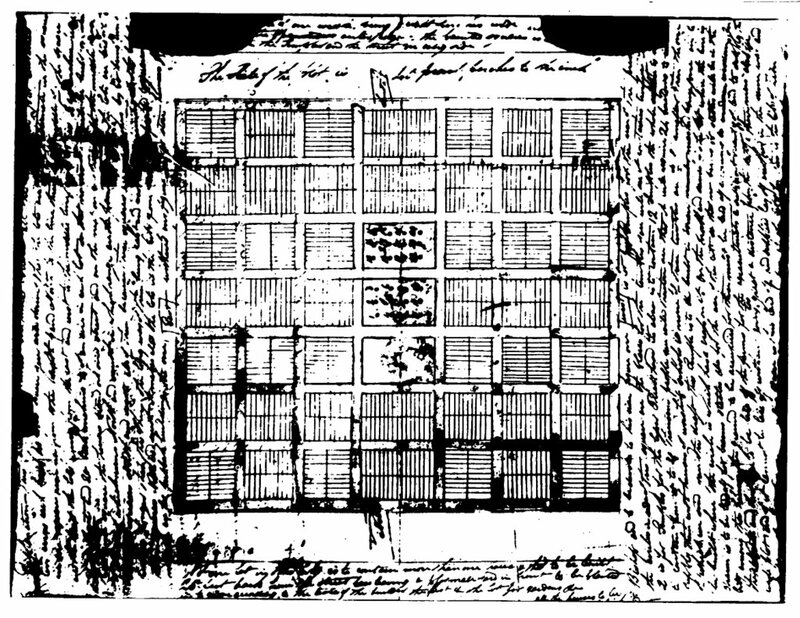 609 – The city of Philadelphia, as seen here on a plan by William Penn in 1682, is generally considered to be the first settlement on American soil to promote the grid outlay. The eventful life of William Penn (1644 – 1718) epitomized the English settler, who brought all the complexities of seventeenth century Europe to the new territories. William’s father was admiral Sir William Penn and his mother Margaret Jasper was the daughter of a Rotterdam merchant. Penn, converted to a Quaker in 1667, aimed at freedom of conscience and equal rights. He defended religious tolerance, both in England and America and was six times imprisoned in his home country for speaking out his opinions. Penn’s intentions contrasted with those of the Puritans of New England, whose goal was a theocracy and despised liberty. The latter used strong-arm tactics, like whipping and hanging to reach their incentives. Their religious vehemence often let to a humiliation of the Indians when their properties were stolen, while William Penn negotiated peaceful purchases. The policy of tolerance and peace attracted many European immigrants, including Protestant sects like Dunkers (New Baptists, an offshoot of earlier Pietism in which a deeper emotional experience was more important than the form), Huguenots (French Protestants, followers of John Calvin (1509 – 1564), Lutherans (followers of Maarten Luther (1483 – 1546), Mennonites (followers of the pacifistic ideas of Menno Simons (1496 – 1561), Moravians (Herrnhuter or Bohemian Brethren) and the Schwenkfelders (followers of the Silesian-born Caspar Schwenkfeld von Ossig (1489 – 1561), searching for a ‘Reformation by the Middle Way’). These groups were, if anything else, an expression of the spiritual turmoil in Europe caused by oppositional thinking. Pennsylvania became in the early eighteenth century, by inviting these people, a melting pot of immigrants seeking the true spirit of liberty. The Scottish-born colonist Sir Robert Montgomery (c. 1680 – 1731) was, just like Penn, an exponent of idealistic colonialism in America. He initiated, as early as 1717, the start of a settlement in what sixteen years later became the colony of Georgia. He tried to solve the problems between the English, Spanish, French and local inhabitants by creating a community which he called the ‘Margrate of Azilia’. The proposed territory covered some four hundred square miles between the Altamaha and Savannah rivers (fig. 610). Modesty was not the strongest point of his character when he declared that ‘my design arises not from any sudden motive, but a strong bent of genius I inherited from my ancestors’. Fig. 610 – The plan for the Margrate of Azilia (The Form of Setling) as given by Sir Robert Montgomery in his prospectus for the project ‘A Discourse Concerning the Design’d Establishment of a New Colony to the South of Carolina in the Most Delightful Country of the Universe’ (London, 1717). A markgraf, or ‘margrave’, originally functioned as the military governor of a Carolingian mark, a medieval province. A margravate was a European term for a border area governed by a ‘margrave’ and Azilia was a fanciful of unknown origin (although there is an early Mesolithic European culture known under this name, referring to a village of southern France, le Mas d’Azil, where the first traces were found). 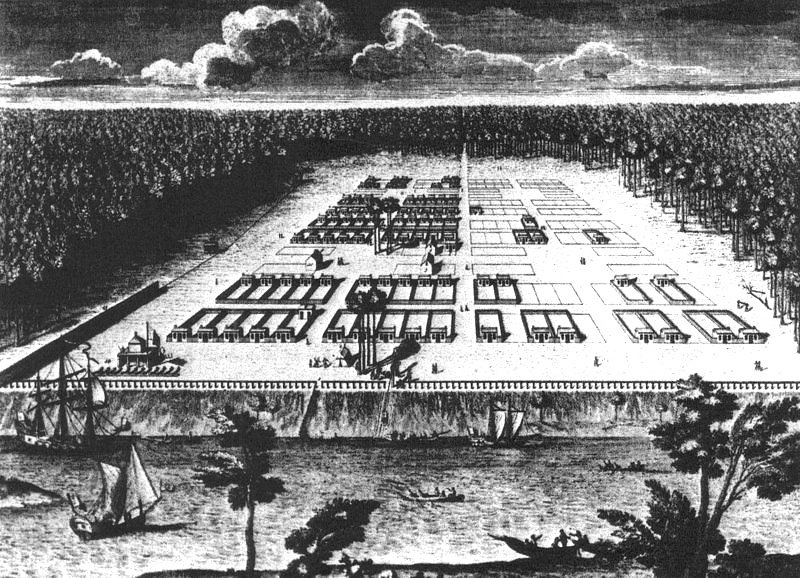 The layout aimed at a corporation of the settlers and the existing Spanish mission. The enterprise failed, but the intentions and the tetradic spirit remained. The city of Savannah (Georgia) did not remain a grid proposal. When James Oglethorpe (1696 – 1785) and his group landed on February 1, 1733 at the site of present-day Savannah, they started to build palisades for protection. Some eleven hundred residents lived in Savannah in 1738, whose major occupation was ‘to secure land, rum and Negroes’. The grid pattern was probably the brainchild of Oglethorpe, or his friend the architect Robert Castell. Many texts refer to Oglethorpe as a ‘strict disciplinarian’. Slavery and strong liquor were forbidden. However, the lack of a labor force was felt as a constraint and many settlers began to oppose their ‘perpetual dictator’. Oglethorpe left the colony in 1750 and all bans were lifted. Fig. 611 – A map of Savannah (Georgia) and its vicinity with the division of land as drawn around 1800 by McKinnon. It might be that Robert Castell, a friend of Oglethorpe’s, provided Georgia’s founder with the inspiration for his plan. Castell cited in his book ‘Villas of the Ancients Illustrated’ (1728) the architectural ideas of Vitruvius, which are reflected in Savannah’s design. The city of Savannah, Georgia was established in 1733 and laid out around the four original squares: Ellis Square, Johnson Square, Telfair Square, and Wright Square; all originated by the coordination of James Oglethorpe, the founder of the Georgia colony and the city of Savannah. Originally, these four squares were named for each ward, Johnson, Percival, Ellis, and St. James. 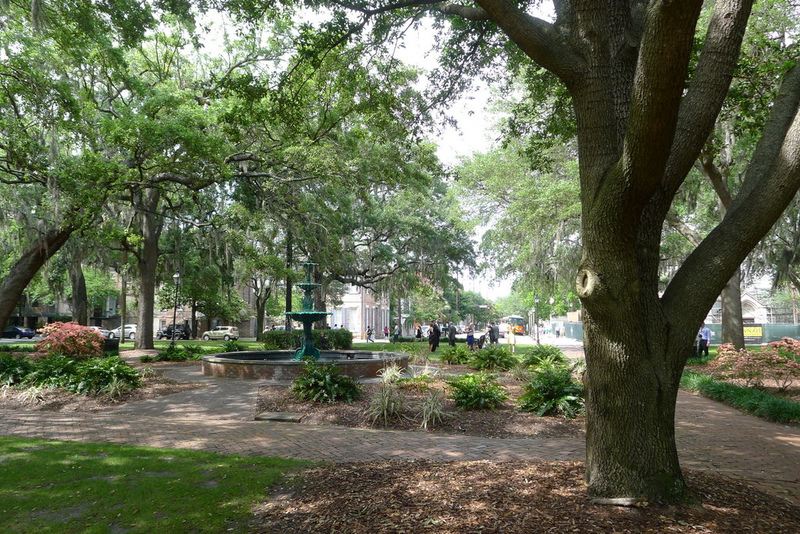 Later, Percival was renamed to Wright Square and St. James was renamed to Telfair Square. By the late 1851, there were 24 established squares in the City (text: Brianne Baggett). Photo: Marten Kuilman (May 2013). Three planned settlements in Kentucky – Franklinville (fig. 612), Lystra (fig. 613) and Ohiopiomingo (on the Ohio River near Rock Haven Landing) – were designed at the end of the eighteenth century by a group of London speculators to attract immigrants. John Russell marked the places on his ‘Map of the State of Kentucky; with the Adjoining Territories’ (London, 1794), but in reality they did not exist. Fig. 612 – The plan of Franklinville in Mason County (Kentucky) depicts an imaginary town designed by property developers (1797). The ‘city’ between the North and Middle Branches of the Licking River had perpendicular streets and blocks of uniform size. The plans (as reproduced in fig. 612/613) were first given in a four-volumed book by William Winterbotham ‘Historical, Geographical, Commercial and Philosophical view of the United States (London, c. 1796) or ‘View of the United States’ (New York, 1796). The British Baptist minister Winterbotham (1763 – 1829) wrote these books while in Newgate Prison for four years because of his liberal views. The book on the United States was a sequel of a similar setup for the Chinese Empire (1795). Fig. 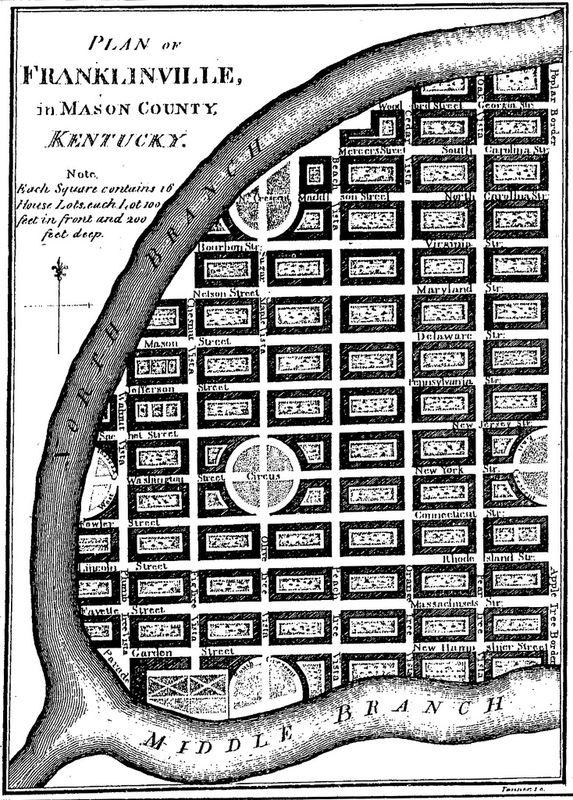 613 – The layout of Lystra (Kentucky) was an imaginary and never-built town in Kentucky, put on paper in 1794 by a group of London speculators. Lystra was to be located in Nelson (later Grayson) County on a branch of the Rolling Fork of Salt River. The increase of grid cities started in 1775 and continued in the nineteenth century. The city of Charlotte in Mecklenburg County (North Carolina) is just an example of many, which urban development runs throughout the various ages. Thomas Polk founded the city in 1768 at the crossroads of the Great Wagon Road and a Native American trading path. Settlers of Scottish, Irish and German descent came from Pennsylvania to live in the Carolina foothills. Charlotte Town was named after the wife of King George III, showing its British loyalty. The grid pattern was chosen in the 1770’s. A ‘gold rush’ started in 1799, some fifty years before the California Gold Rush of 1848. The Carolina Mint functioned from 1837 to 1861, minting local gold. The city’s boom years were between the 1910s – 1920 when the government established Camp Greene. The settlement was named after a war-hero called Nathaniel Greene, and constructed in less than ninety days in 1917. The United States of America, under president Woodrow Wilson (1856 – 1924), had long stayed out of the World War I in a policy of isolationism, but declared war on Germany on April 6, 1917. Camp Greene became a city unto itself with its own facilities. Many soldiers remained in the area after the Great War and Charlotte was rapidly transformed into a modern city. The grid pattern was abandoned and the landscape architects and city planners took over. The Olmsted Brothers were America’s most well-known name in this branch of urban architecture. Father Frederick Law Olmsted Sr (1822 – 1903) helped (together with Calvert Vaux) to design Central Park in New York in the 1850s. He went on to create park systems in almost every major US city (Prospect Park in New York, Chicago’s Riverside subdivision and the terrain for the Chicago World Exposition in 1893 and Buffalo’s and Boston’s park systems). He died in 1903 and the brothers John Charles and Frederick Law Jr. took over the firm. By 1912 the overall street plan of Charlotte was complete. Since then the city had become a banking and financial center in the US (HANCHETT, 1998). The icons of business erected the modern high-rise buildings like Wachovia building (One Wachovia Center, 179 m; 1988), the Bank of America building (Bank of America Corporate Center, 265 m; 1992) and the Hearst Tower (201 m; 2002). Charlotte (North Carolina) is today, measured by control of assets, the second largest banking headquarters in the United States after New York City. Much of the icon status of the banking community was seriously flawed in the crisis of 2008, when it turned out that their prosperity was based on thin air. Fig. 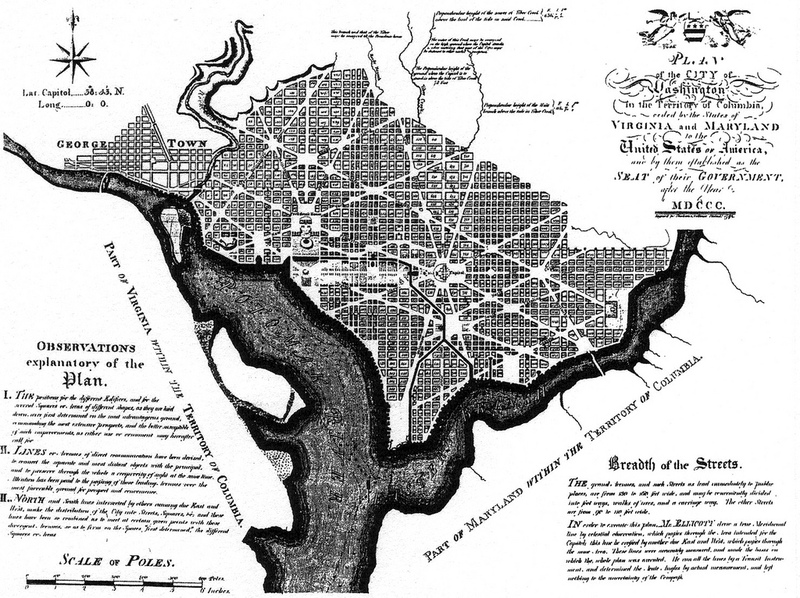 614 – The city plan of Washington D.C by the surveyor Andrew Ellicott (1754 – 1820) and published by James Thackara and John Vallance in November 1792 became the official city map for government and property developers. An earlier version of this map was printed in Boston in 1792 and was an adaptation of L’Enfant’s first draft of the planning map in June 1791. The French-born architect and civil engineer Pierre (Peter) L’Enfant (1754 – 1825) first drew a plan for Washington D.C. in 1791 (fig. 614). He used diagonal and radial avenues superimposed upon a gridiron street system in the classic European Baroque style with long sight lines. Comparisons with the layout of Versailles and Paris had been made. The commissioners of the renewal plan of 1901 (McMillan Commission) traveled to the French places, which presumably influenced L’Enfant. The cross feature (to the northwest of the palace) and the fork pattern (to the south east) on the map of Versailles – as produced by the renowned landscape architect André LeNotre (1613 – 1700) (see fig. 29) – does not play a structural role in the modern-day perception of the plan of the capital Washington DC. The New York City grid can be regarded as the most characteristic and daring grid plan in American history. The Commissioners Plan of 1811 was the result of four years of deliberations on the land development of upper Manhattan between Fourteenth Street and Washington Heights. This area was at that time still covered by hills and swamps, which had to be leveled and filled. The visual and practical impact as provided by the horizontal and the vertical lines in the area between the Hudson River to the west and the East River is firm and impressive for any modern visitor to the city (fig. 615). Fig. 615 – The grid of New York was laid out between 1807 – 1811. The initial plan called for twelve numbered avenues running north and south. Each avenue was to be hundred feet (30 m) wide. The Middle Way (now Fifth Avenue) formed the main north-south axis. Hundred-and-fifty-five orthogonal cross streets were projected. The main streets were to be no less than sixty feet (18 m) in width. The diagonal of Broadway only interrupts this grid pattern. The surveying and flattening of the huge area north of the city often met with many difficulties. It was recorded that a woman selling vegetables started to throw artichokes and cabbages to drive the surveyors off the land. The young city also featured the first major urban park in the country. The City of New York acquired in 1853 a stretch of land, which was transformed by the distinguished landscape architects Olmstead and Calvert Vaux into the Central Park. The archetypal grid pattern of New York at the beginning of the nineteenth century did not seem to have a particular religious background, but was guided by a Zeitgeist, which favored an organized multiplicity. On the other hand, the initial settlement by the Dutch some two hundred years earlier (in 1626) had an orthodox component as noted before (p. 740). The community, then known as ‘Nieuw Amsterdam’ and later governed by the notorious fourth Director-General Peter Stuyvesant (1646 – 1664), followed a grid outlay, which might have been conceived in and endorsed by a Christian-religious state of mind. John REPS (1965/1969; p. 410) stated that ‘the year 1830 saw the birth of a new religion, one among the dozens spawned in the backwaters left by the advancing waves of the frontier. This Church of Jesus Christ of Latter-day Saints – or the Mormons as they soon were called – became the most successful city builders of all the religious and utopian societies’. The movement of Joseph Smith (1805 – 1844) started in Fayette in the state of New York and moved towards the west. Their first departure was to Kirtland (Ohio), where a Mormon temple was built. A dream in July 1831 revealed to Smith that the future kingdom of Mormon should be created in Jackson County (Missouri), roughly the center of the North American continent. So a group settled in Independence (Missouri) to survey the area. They received, in 1833, a detailed instruction of Smith how to build a new city (City of Zion), which could hold a population of fifteen to twenty thousand persons (fig. 616). Smith’s eventful life, including visions of God, organizing a new social order, wildcat banking (Kirtland Banking Society), a candidacy for President of the United States and some stings in jail, ended with his assassination in Carthage, Illinois in June 1844. Fig. 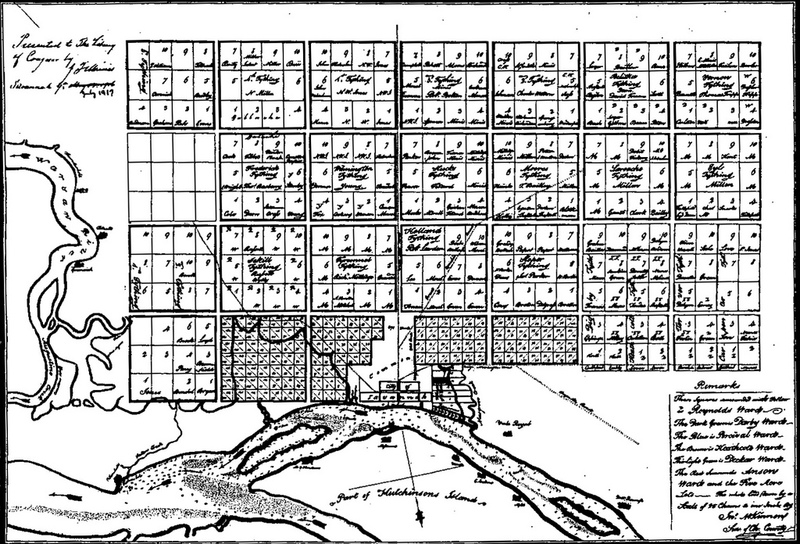 616 – This intended plan of Zion City was given by Joseph Smith, the founder of the Church of Jesus Christ of Latter-Day Saints (Mormons), to his followers in 1833. The three central buildings functioned as Temples for the Priesthoods (High and Lesser) and Bishop’s store houses. The center is surrounded by a 7 x 7 grid of blocks with alternating axes. In the end, the city of Far West in Caldwell County (Missouri) was built along these specifications, but nothing has left of this settlement. The population of Independence and other towns in Jackson County started to resent the Mormon influx and after some time the new arrivals of Far West had to move again, this time to the east. Nauvoo (‘the beautiful’) on the banks of the Mississippi River in Illinois became their settlement. The idea of a religious utopia in the wilderness and the establishment of a model society took shape on a larger scale when the movement settled down in Utah and started to build Salt Lake City in 1847, again along a stringent uniform grid (fig. 617). Fig. 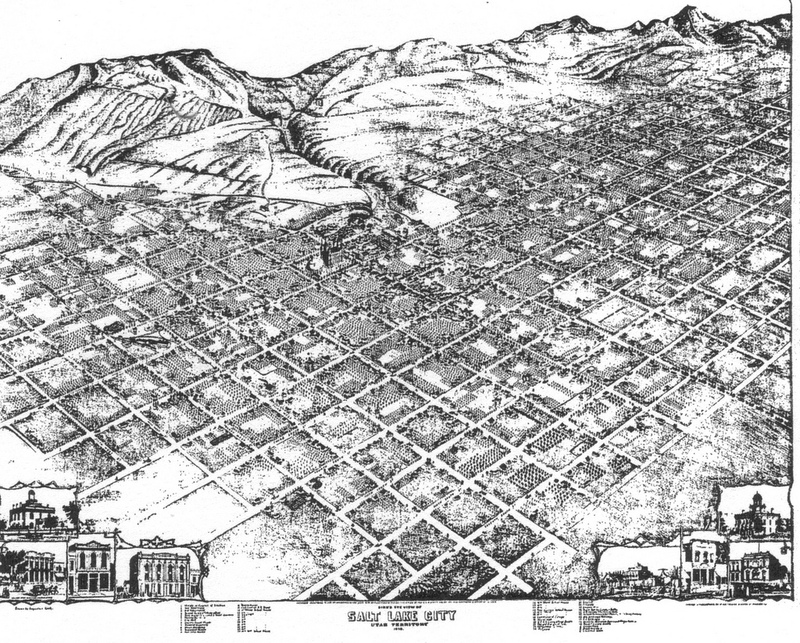 617 – A view of Salt Lake City (Utah) in 1870, just after the continental railway reached the city, which brought an end to some twenty-five years of isolation and a founder’s spirit based on a religious belief. The centralized planning was efficient for some time, but things were beginning to change when the transcontinental railway reached the city in 1869. Its presence ended the geographic isolation of the city (which had about twelve thousand inhabitants at that time of which 90% was Mormon). Some twenty years later the population had risen to forty-five thousand inhabitants of which half was non-Mormon. The population became more diverse in the last quarter of the nineteenth century and a conflict between Mormons and Gentiles (or non-Mormons) arose, leading to skirmishes on the political front. The struggle to retain the conservative, communal values based on religion and the progressive minds of a modern society was caused by the limitations of oppositional thinking. The disagreements began to moderate after 1890 due to a further influx of immigrants. Religious controversies were subdued by 1920. The intertwining of a psychological setting geared towards strong beliefs in right and wrong, an architectural peculiarity (a grid city) and the sociological factor of people working in the arms industry is probably more than a coincidence. It might well be, that the choice for straight lines in a city design finds its roots in that same belief of moral straightness and in an occupation, which is concerned with physical force (resulting in different forms of murder). The uniting entity in this sociological setting is, no doubt, an oppositional (two-fold) frame of mind. Not every tetradic appearance (in architecture) refers to a four-fold way of thinking, but these features can also be the result of a stringent application the two-fold (oppositional) way of thinking. The gridiron town fits – as a graphical expression – into the Second and/or Fourth Quadrant state of mind, which either occur in a young phase of a development or towards its end. These two options still have their influence in America, but the former is more prominent since the American culture is in an earlier stage (from a European point of view). Many grid cities were built in a youth-full spirit. The open space opened possibilities, while the pockmarked history of Europe after 1650 assumed a type of blending in. For many settlers, the route to America was not only an adventure in the physical sense, but also a search for a different type of division thinking – although it has never been described that way. The European religious evacuees of the seventeenth century, like the Quakers and the Puritans saw their (total) devotion to God – which in itself was a sign of a Third Quadrant mind – threatened by other oppositional thinkers, who were not willing to compromise. Therefore, the crossing of the Atlantic Ocean was also the search for an environment in which their (rigid) ‘Third Quadrant’ state of mind was not threatened. Some of them might even have dreamed of a ‘Fourth Quadrant’ experience, a feeling of freedom, because of the lack of opposition. 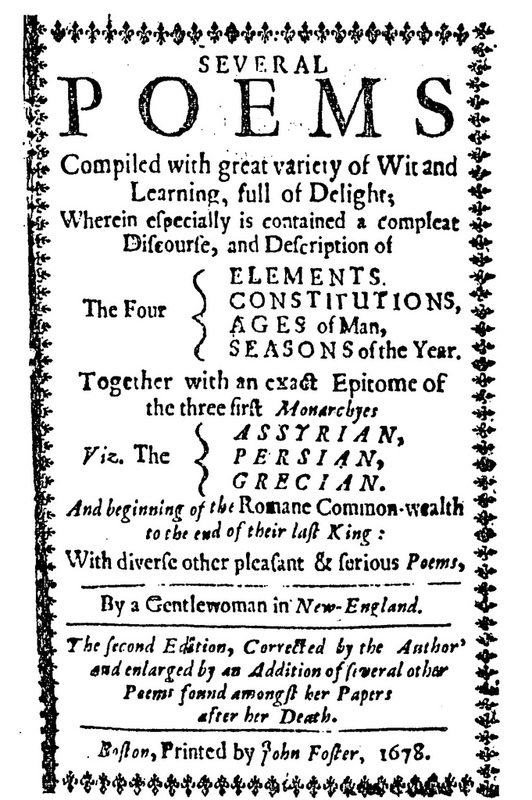 The ‘first American lady poet’ Anne Bradstreet (c. 1612 – 1672) could be mentioned as a person searching for salvation and spiritual freedom in undiscovered lands. She had a rather sensitive character and was prone to depressions. As the wife of a Puritan settler (Simon Bradstreet) she arrived in the Massachusetts Bay Colony in 1630 and had already five children when she was thirty. Another three children were born when living in the settlement of Andover (Essex County, Massachusetts). Bradstreet toyed with the four-fold in a peculiar way in some of her poems. It was like someone longing for solutions in an incomprehensible world. In a modern (quadralectic) view her split character was unable to escape the bonds of oppositional thinking – which is a highly opportune theme by many people. Her longest poem was called the ‘Four Monarchies’, a classical tetradic theme in ancient history (and the Biblical story of Daniel). The fourfold was again instrumental in poems like the ‘Four Ages of Man’, the ‘Four Humours in Man’s Condition’ and the ‘Four Seasons’. Her main sources were found in Puritans libraries, in books such as Sir Walter Raleigh’s ‘History of the World’, Archbishop Usher’s ‘Annals of the World’, and William Pemble’s ‘Period of the Persian Monarchy’. Many more examples of American cities can be given in which the grid played a formative role in the urban development. The city center of the fourth largest city in the United States, Houston (Texas) is probably the ultimate form in which the grids themselves act as structural units (fig. 618). Fig. 618 – The central part of the city of Houston (Texas) is constituted of a number of grids, running in different directions. Houston was founded in 1836 and became the capital of Texas in 1842. The digging of the Houston Ship Canal marked the beginning of an unprecedented economic growth based on in- and export of oil and agricultural products. A fast chemical and pharmaceutical industry was added in due course and the NASA’s Johnson Space Center put the first man on the Moon. The Old Market Square is the historic town center and a number of old buildings were recreated in the Sam Houston Historical Park. 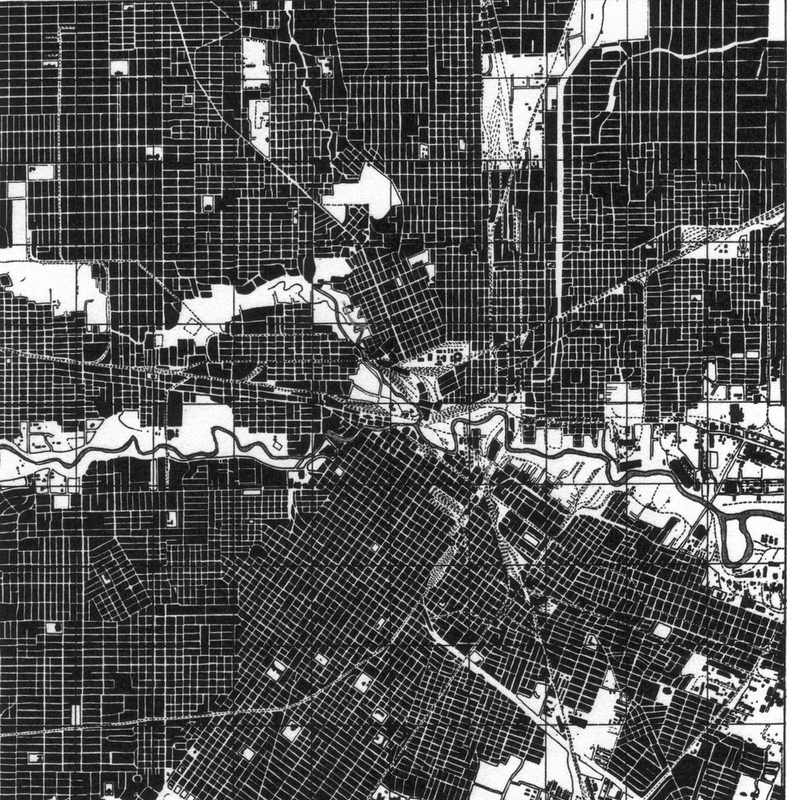 A full grid was already developed in 1873 and given as a ‘Bird’s Eye View of the City of Houston’. The drawing was by Augustus Koch, a prolific itinerant city-view artist, and published by J.J. Stoner (Madison, Wisconsin). Popular series of bird’s eye views of American (grid) cities comprised Austin, Mount Vernon, Columbus, Circleville (1876, fig. 533-534), Salt Lake City (fig. 617) and many others in Ohio and Michigan. There are exceptions, but it is fair to say that the grid town is a hallmark of urban America (and for Australia as well). The position of the boom periods at the end of the eighteenth century, the beginning of the nineteenth century and the religious inspired building from the first quarter to the third quarter of the nineteenth century are given in fig. 619. The CF-graph of the American cultural period was given earlier as fig. 551. Fig. 619 – The positions of the major concentrations of grid cities are given here on the CF-graph of the American cultural period. The start of the communication cycle (from a European point of view) is taken in 1492 and the First Visibility (FV) is positioned in 1776. 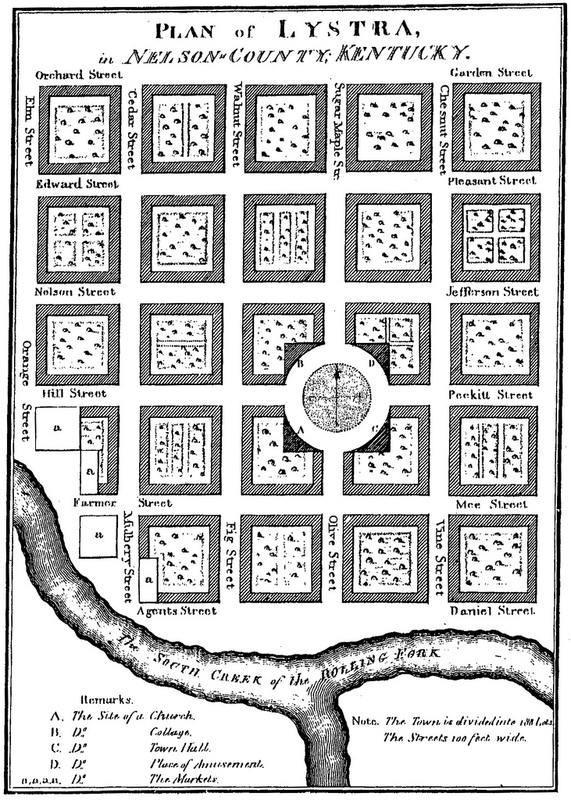 The first grid-cities, like Philadelphia (Pennsylvania), were designed as early as 1682. The majority followed at the end of the eighteenth century. They were either religious inspired (like the colonist settlements in New England), proposed by London-based project developers (Franklinville, Lystra, etc.) or had a ‘Baroque’ pedigree (Washington, DC). The (early) nineteenth century saw a further characteristic development of places like New York and Houston, following strict grid patterns. 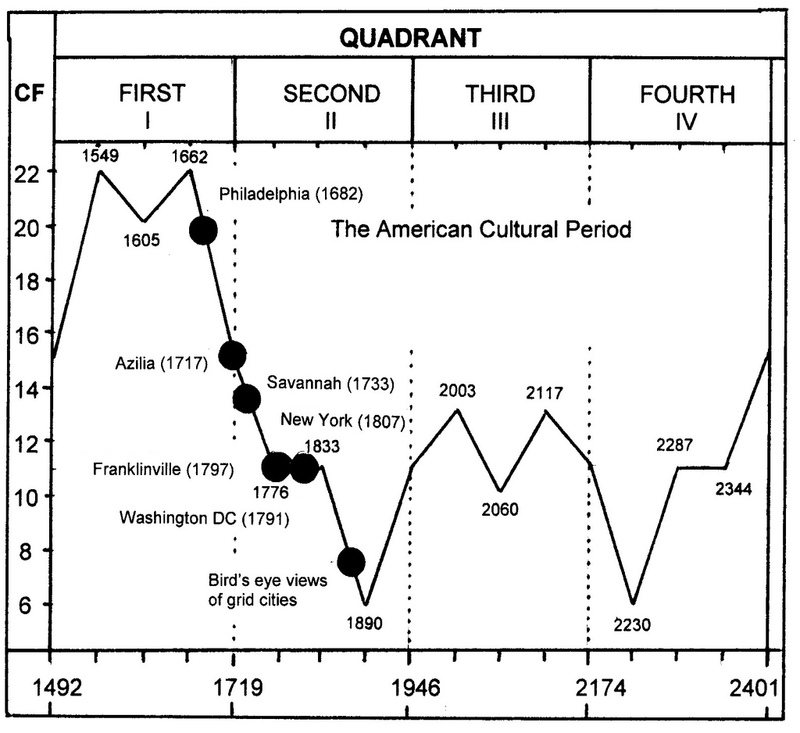 Most American grid cities are concentrated in the Second Quadrant (1719 – 1946) of the communication cycle. Colonialists from Europe-in-its-Third- Quadrant transferred certain ideas on city planning, tried them out and in the end wholeheartedly embraced the ‘home-made’ grid design. It will be interesting – for future historians – to see how the grid will fare in the Third Quadrant (1946 – 2174) of America’s cultural history. Will the ‘grid’ spirit last or will it be replaced by something else? Only time will tell.